Winter Tyre Reviews - What Are Winter Tyres? So as we have touched on already winter tyres are produced from special rubber compounds that stay softer at lower temperatures which means that the tread blocks are more flexible and the tyres generate more grip on the road. Also the tread design of a winter tyre is characterised with grooves in the tread blocks, the so called sipes. These sipes make the tyre stick to the road surface as the tread of the tyre deforms when the wheel starts to turn. The sipes provide grip when braking as well as accelerating. The sipes on the outside shoulder often run across the blocks while sipes are also provided in the drive direction (zigzag) to increase stability in bends. 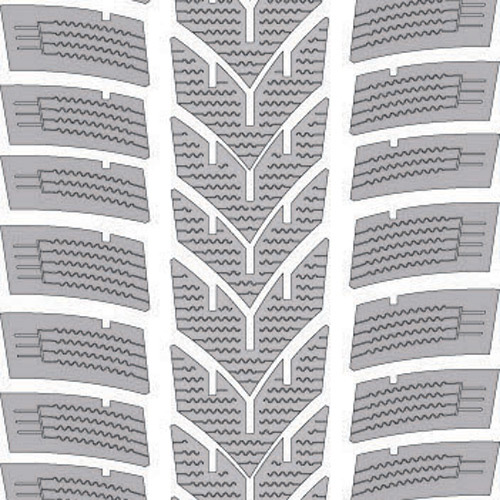 The diagram displays a typical winter tyre design, note the many sipes that run across the tread blocks. In addition to the sipes you will notice that the tyre has a much more aggressive directional tread pattern than those found in summer tyres. This is common in winter tyres and allows water/slush/snow to be cleared from the tyre easily for optimum performance. A directional pattern is not essential and many manufacturers have moved to asymmetric designs in order to help reduce noise. Pesky tyre label legislation now means that a tyres (external) noise has to be published at point of sale so tyre producers are trying to make their tyres quieter all the time. To be honest though the increase in noise from a directional tyre is minimal and I’d rather have the increased performance that this offers but that’s the world we live in. There are also markings in the sidewall engraving that set official winter tyres apart from the rest. In addition to the standard M+S-coding, official winter tyres are also provided with a special mountain & snowflake symbol. This industry implemented standard indicates an official winter tyre has met all requirements. Winter tyres are only granted this symbol when they have passed a series of brake tests on snowy surfaces. All winter tyres discussed on this site have passed this testing method and have the snowflake symbol in addition to the usual M+S-coding.